Four years ago, in February, 1908, to be exact, Albert Herter established on East 33d Street in the heart of New York City, the looms that bear his name, and started to weave tapestries of the kind woven in the Netherlands in the time of Philip the Handsome, Margaret of Austria, and Charles V. Though a painter by profession, Mr. Herter has a keen appreciation of tapestry texture, which he has developed by personal work at the loom. In this he follows William Morris whose views and practice are expressed in chapter V (Mortlake, Merton, And Other English Looms). Like Morris, he has a particular liking for Late Gothic "verdures with personages," as illustrated by the tapestry I reproduce on plate no. 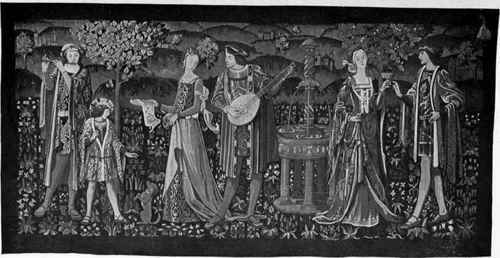 215, and by the one woven for the upper wall of the hall in the house of Mrs. E. H. Harriman at Arden. The latter is fifty feet long by five feet high, and backgrounds American dryads and nymphs of forest and fountain, with trees and flowers, birds, rabbits and foxes, native to Arden. Later in style - definitely Renaissance with wide and luxuriant borders - are two panels each 9 feet 11 by 7 feet 8, picturing one a hunter with his dog, the other a lady and a flower girl. Quite different in type is the armourial panel 8 feet by 5, woven for Mr. John De Kay to hang in his French castle, the Château de Coucy. Especially interesting should be the set of 26 panels now on the looms, picturing the Story of New York back to the days when Peter Stuyvesant smoked his long-stemmed pipe and cursed in Dutch. Plate no. 215. A Late Gothic verdure with personages, designed and woven in America. This modern tapestry in ancient style is interesting to compare with plate no. 327. It is an admirable attempt to reproduce the texture of the Golden Age of Tapestry. Artists and weavers who work along these lines are on the high road to restore the most beautiful of the arts.